Ok, this one is kinda different (for me anyway) but I was really, really fascinated by the premise and the behind-the-scenes story of these books. Multnomah Books just recently released the final two books in the six books Knights of Arrethtrae series by Chuck Black. They sent me a copy of Sir Quinlan and the Swords of Valor (Book 5) and Sir Rowan and the Camerian Conquest (Book 6) for review. "Many kids today are being let off the hook," says Black. "They're abandoning activities that encourage creativity and self-development for forms of escapism like additions to video games or social media." He believes stories of everyday heroes who find courage in the face of fear will help youth rise above the low expectations set for them in today's world and realize God has a quest for them as well." Black is also a former F-16 fighter pilot and, I confess it, I figured if his books were picked up by Multnomah, they wouldn't be "that bad." (I've picked up a few books written by home schooling dads that self published and I was less than impressed. Yes, I admit the bias towards self-publicized works!) I wasn't far off the mark in suspecting that this would be an interesting series. Black manages to hold his "tone" for the book pretty well. The introduction, as I said, sets the stage for a battle between good and evil. 4. I liked the way Black handled the battle between good and evil. Conservative parents will be happy to note that Chuck Black avoids the use of magic in these books. So if you aren't sure what to make of Harry Potter or even my beloved Chronicles of Narnia, you can breathe easy with the Knights of Arrethrae series. Each one also hits on a particular character quality such as courage - or it battles against undesirable traits such as greed or apathy. 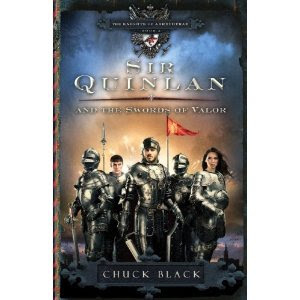 I think there are definitely things to like about this series and so I'm happy to let you know that Multnomah Books has graciously offered up a copy of Sir Quinlan and Sir Rowan to one of you. To win? Simply leave a comment below. This contest will be open through Thursday, October 21st. US Residents only. Thank you, Multnomah Books, for your generosity in sending me these books to read for myself, as well as for offering a copy to one of my readers. THIS CONTEST IS NOW CLOSED. THE WINNER (selected by Random.org, of course!) is #5 - Serena! Congratulations! Sounds like an interesting series. I'm like you, I don't like coming into a series of books in the middle. I've picked up a few books at the library only to put them back down since they are the second or third book in a series (usually to see if I can find the first book). Thanks for the giveaway! I really like knightly stories. I did get an e-mail from a home school dad once with a link to an excerpt from his book -- and it was pretty bad. I am glad this one is good as I'd really like to support such an endeavor. This may be a little on the young side for my youngest, but I;d love to give it a try. Thanks for the giveaway! These sound interesting. Please enter me. You really intrigued me with your description of these books. Thanks for offering this giveaway. Oh, this sounds good. thanks for the giveaway. My son (13 today!) loves all of the books by Chuck Black--this series, and his previous series. His dad has read all of them aloud to him at bedtime. We would LOVE to win! I love anything medieval, so these look interesting to me now and for my kids later on. Thanks for your insightful review! I am very interested in these books. In fact I would love to be able to give them to my sister. We just recently had a conversation where she was lamenting the fact that she loved medieval literature but hated all the magic. Thanks! They sound great. I think my son would really like them. After reading the Kingdom Series my son is very eager to read The Knight of Arrethtrae Series. Please do enter us.